Adding a label to your finished handmade and craft items adds that special little touch and completes it. We offer a wide range of custom personalised sew in fabric labels that can be full-colour printed making them ideal for your design including logos, come in a variety of both flat and folded sizes and are pre-cut and sealed to save you time. 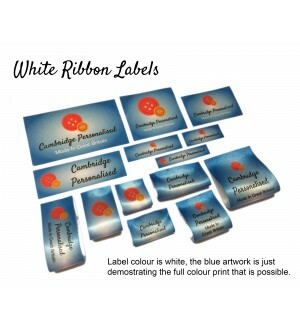 The satin ribbon we use for our labels is British made and won't fade when washed, we sell our fabric labels in packs of 20 so there isn't a minimum order. We send you a design preview before starting production and delivery is quick, re-ordering is simple as we save all designs. Some label sizes allow details to be printed on the reverse e.g. wash care or your business details for future orders, you'll also find our labels are well priced.